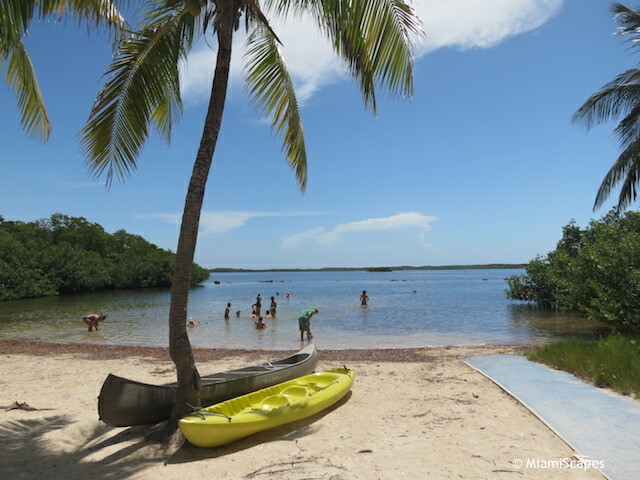 John Pennekamp State Park, mainly famous for the coral reefs and underwater wonders lining the eastern boundaries of the park, has in fact much to offer to nature and outdoor lovers. There is of course the diving and the snorkeling, but also canoeing, kayaking, fishing, nature boardwalks and camping, and for the more sedate, little beaches in which to laze around, enjoy a picnic, go for a dip in the water, admire our fantastic sunsets... This is one of our favorite parks to chill for a day. When you visit the park, take your time... take advantage of everything it offers! The Park Entrance is off US Highway 1, mile marker 102.5. Here you pay the entrance fee. Don't forget to get a park map at the entrance. Here are directions and entrance fee information. John Pennekamp's Visitor Center is worth a stop. 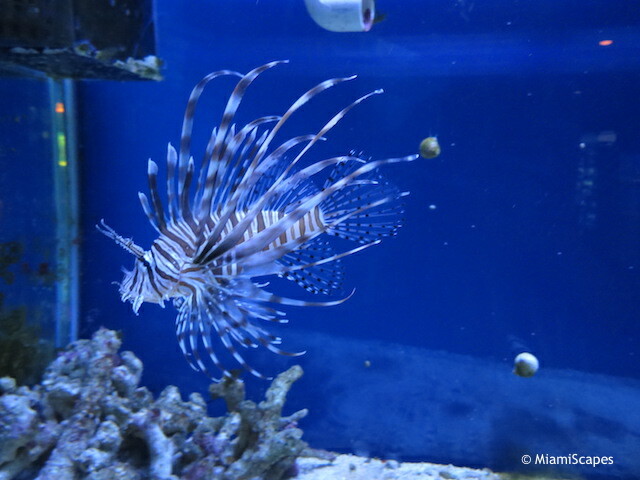 There is the usual park information and exhibits, super-helpful staff AND a 30,000 gallon salt-water aquarium that will take your breath away, just a little sample of what the offshore reefs at the park's doorstep have to offer. 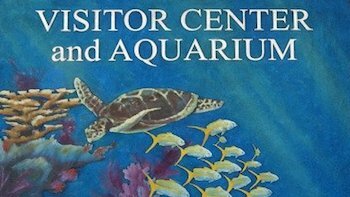 Here's more on the Visitor Center and Aquarium. Snorkeling Rentals and Tours. 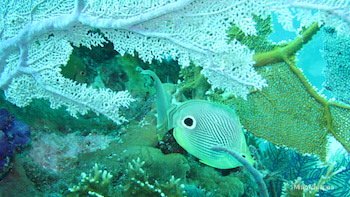 Many snorkeling tours to the reefs are offered during the day, there are short 2.5 hour tours and extended ones for 4.5 hours covering different spots. 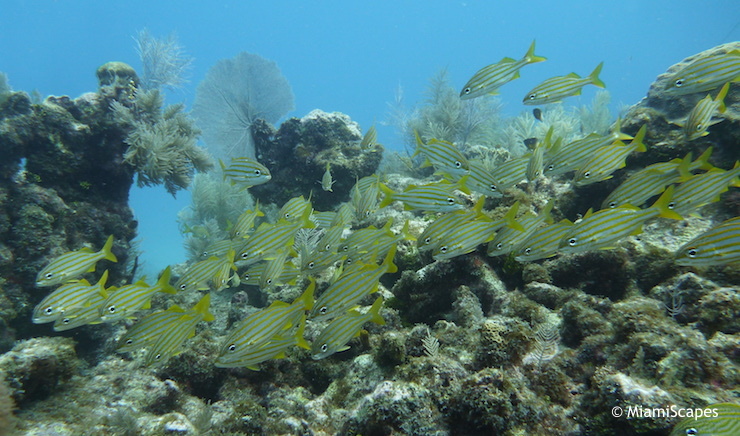 Here's more on Snorkeling at John Pennekamp. Kayak and Canoe Rentals. The park's coastlines are surrounded by mangrove forests. The many creeks and protected lagoons offer great opportunities for even novices and first-time paddlers. Here's more on Kayaking and Canoeing at Pennekamp. Glass Bottom Boat Tours. For those that don't want to get wet! The Spirit of Pennekamp brings you to the reefs and you can observe the beautiful corals and marine life from the air conditioned comfort of this 65-foot vessel. There are 3 daily trips lasting 2.5 hours. 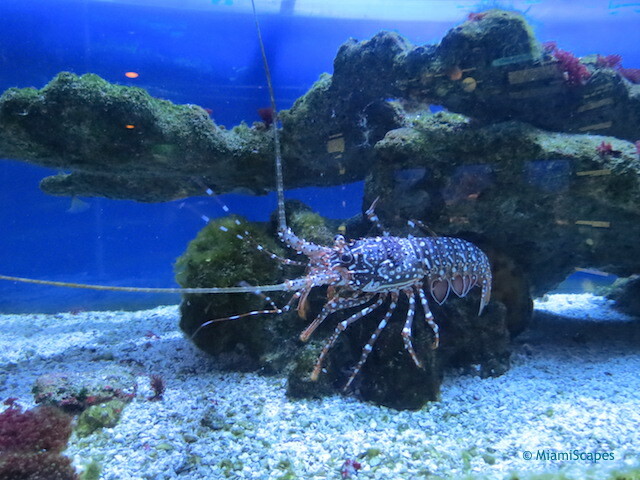 Here's more on the Glass-Bottom Boat Tours. Three small sandy beaches are found within the park. Great for sunning and swimming, you can also bring a picnic and try out your snorkel! Here's more on the Beaches and Snorkeling from the shore at Pennekamp. John Pennekamp Marina. 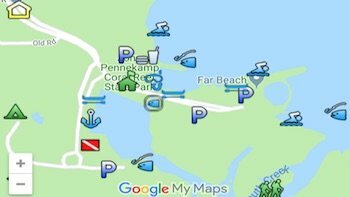 Available at the marina are boat rentals, dock rental, a dinghy dock and canoe launch. For Boat Slips & Mooring Rates call (305) 451-6325. Scuba Shop. 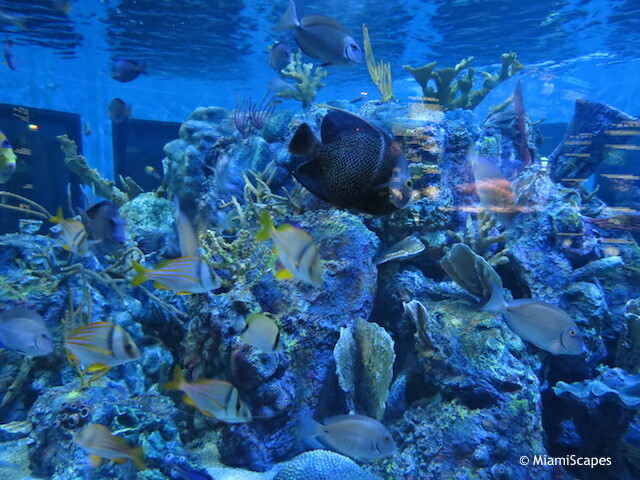 The Scuba shop is a full-service PADI facility, offering scuba rentals and tours. 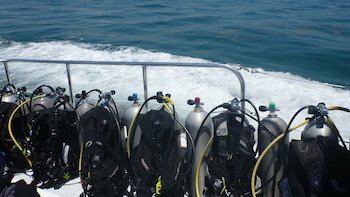 More on Scuba Diving at John Pennekamp. Fishing. You can cast your line at any of the designated areas marked in the map but remember you will need a saltwater fishing licence. Spearfishing within park boundaries is a no no, so is taking anything from tropical fish, shells, coral, etc. Camping. 47 sites with full hook-ups and nicely equipped facilities including picnic tables, grills, clean restrooms and showers. Call 1-800-326-3521 for more info. 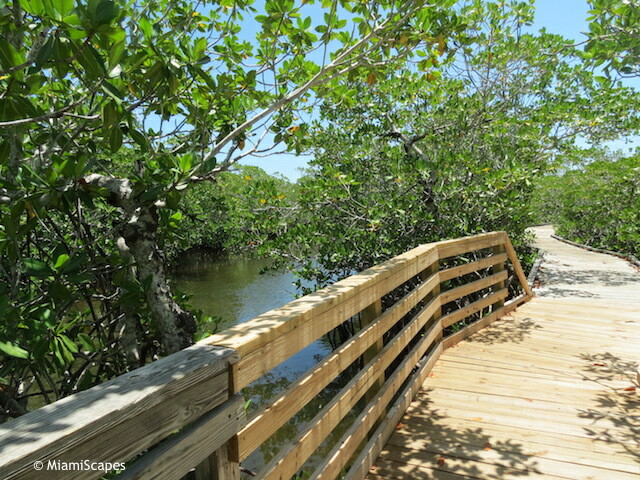 Mangrove Trails and Boardwalks. There are a couple of trails at the park that are quite enjoyable for an easy stroll and in the cooler months some birdwatching. They are wheelchair accessible as well. 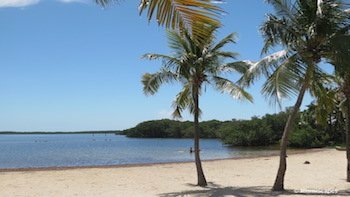 There are plenty of parking lots convenient to the Visitor Center and Concessions, beaches, dive shop and marina and the camping sites. Although parking is plentiful, on weekends and holidays parking spots go fast! 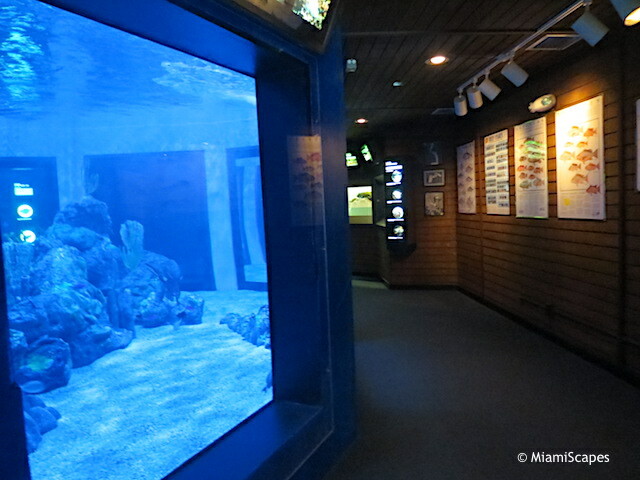 The Visitor Center's main draw is the Aquarium and marine exhibits which give you a little sample of the beautiful reefs and marine life that where the inspiration behind America's first undersea park. Mangrove forests line the coastlines of John Pennekamp State Park, and there are trails and boardwalks that take you through them and along the creeks and sounds. They are not long and well-maintained, you'll see all three types of mangroves, red, black and white. Wildlife is plentiful in the cooler months, specially shorebirds along the water or nesting on top. In the summer, although there is plenty of shade, it gets very hot and humid, bring mosquito repellent! 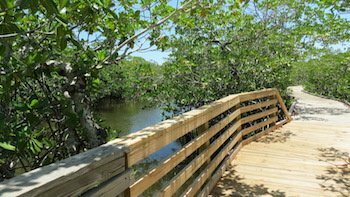 The mangrove boardwalk takes you through a great forest of red, black and white mangroves. 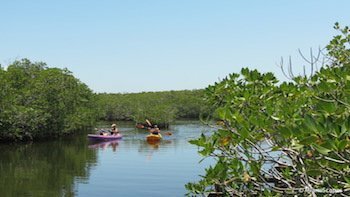 If you are interested in the mangrove habitat and would like to learn more about the forests, you should not miss Everglades National Park. Take the Florida Turnpike South all the way to the end, it turns into US Highway 1. 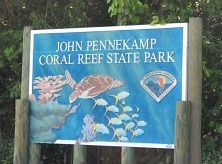 Stay on US 1, as you enter the keys, John Pennekamp Coral Reef State Park will be on your left, at mile marker 102.6.